You’ve probably read a few things online or heard from a friend that if you want to stop hair loss you should try an organic cold pressed castor oil for hair growth. 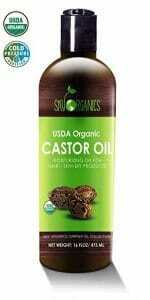 But, what is often left out is the best way to use that castor oil. There aren’t too many wrong ways to use it, but I think that making your own hair mask to leave in overnight is the best way to absorb all the fatty acids that help stop hair loss and result in a thicker head of hair. In this article I will highlight why I think that is and give you some ideas on how to make your own hair masks with the best castor oil for hair growth. Before I begin let me clear the air about castor oil. For centuries it has been used as a remedy against constipation. And even today it is still. But, when used topically as a cosmetic it doesn’t have any effect in that way. So, go ahead and use castor oil on your skin and hair without worrying about needing to be near a bathroom! Let’s start with what it does for the scalp, because your scalp determines how healthy your hair will grow. Organic cold pressed castor oil is rich in ricinoleic acid which has natural antibacterial and antifungal properties. This cleanses your scalp and reduces the effects of seborrheic dermatitis which is a type of dandruff that clogs the pores. It relieves eczema and folliculitis. All of these skin disorders impact your hair growth. Taking care of the skin will allow your hair to come in thicker and healthier. Improved circulation of the scalp also nourishes your hair at the root. Bringing oxygen and nutrients to the papilla will also give you a thicker hair follicle. Organic cold pressed castor oil has a lot of antioxidants that support the keratin in hair. This leads to stronger hair shafts, smoother and less frizzy hair. Will castor oil help your hair grow? If your hair loss is due to male pattern baldness or genetics, then it will not regrow hair that has fallen out. If your hair is starting to fall out because of a dermatological reason like I went over in the last section, then yes, it can help your hair grow. Always take this with a grain of salt. Don’t expect a miracle, and you will be happy with any results you see. If you’re just trying to slow the hair loss and want thicker healthier looking hair, then you will see some nice benefits. If you are already bald on top and think that castor oil will help you, then you will be disappointed. Why use an organic cold pressed castor oil hair mask? Whenever you use castor oil, and whatever kind you happen to use, it needs some time to absorb into your hair. Castor oil is quite thick and needs time to really penetrate. Making a hair mask with it and leaving it in overnight will really see the effects from castor oil that you are looking for. You’ll give yourself a deep conditioning treatment with a cold pressed castor oil mask that will heal damaged hair. The DIY cold pressed castor oil hair masks will treat each of those issues really well. The best castor oil for hair growth that you’ll want to use in a hair mask is cold pressed castor oil. 100% pure is also a must. You’ve probably seen articles about how good Jamaican black castor oil is for your scalp and hair. It is very good, but in this case, it should be avoided. Black castor oil is highly alkaline and will dry out your scalp if left in too long. By using an organic cold pressed castor oil, you’ll be gentler on your skin. Make sure that the ingredient list says only castor oil. 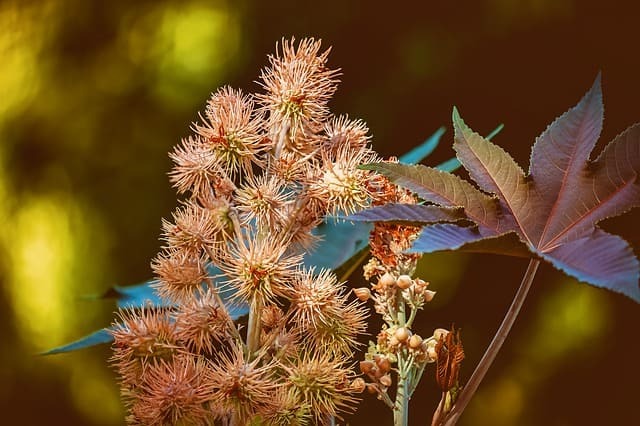 Avoid castor oils that have additives and preservatives and used a chemical process for extraction that contains hexane. All of these things either are bad for your skin and hair, or don’t contain the nutrients needed to heal and nourish your skin and hair to permit some growth. This is 100% pure and everything I look for in a castor oil to be mixed for DIY projects. It is not as thick as some which makes it easier to apply. Let’s go over some recipes that you can make yourself to tackle these common hair problems. If your hair is brittle and just dull, then you should try this ultra moisturizing recipe for a leave in conditioner for your hair. The aloe will smooth out your hair and leave it extremely soft. Since cold pressed castor oil is a natural humectant, it will retain the moisture and make it look and feel thicker. Your scalp will also benefit from the combination. It will repair dead skin cells and prevent dandruff which will stimulate your hair to grow. Your hair will benefit from leaving this on overnight, but you can also put it in after your morning shower and go about your day. To make this mask, add equal parts aloe vera gel and castor oil and mix it well. This is going to be a thick mixture, so you may want to use a whisk to make sure it is properly mixed. Put it in a glass or plastic jar and give it a good shake before every use. If you have greasy scalp and hair that may be contributing to your hair loss then this best castor oil for hair growth mask should show you some results. You’re giving your hair a double whammy with the combination of castor oil and coconut oil. Coconut oil can help regulate the sebum on your scalp that makes your hair greasy. And the cold pressed castor oil is great at cleaning out your pores and leaving your scalp disinfected so you don’t end up with acne or other skin conditions. To make this mask, use 2 parts coconut oil to one part castor oil. Since castor oil and coconut oil can go on thick, you don’t want to add to the greasiness, which is why you should use more coconut to castor ratio. Getting rid of dandruff doesn’t mean using an anti dandruff shampoo with harsh chemicals. 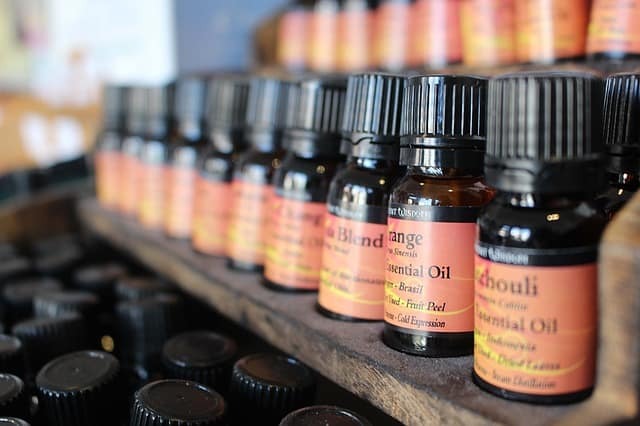 With the help of castor oil and a few other essential oils, you can get rid of dandruff once and for all. Really bad dandruff can clog your pores and make it hard for your hair to grow. This is a great mask to not only remove and prevent dandruff but also to help your hair grow in better. Sweet almond oil in combination with castor oil will help to stimulate blood circulation in the scalp and reduce the irritation from dry skin and dandruff. Combine that with the anti dandruff properties of clary sage and rosemary oils and you have a great, natural way to get rid of dandruff and stimulate hair growth. A little lavender soothes the scalp and adds a floral fragrance. To really stimulate the scalp, clean out your pores and hair follicle roots and strengthen your hair during its growth phase, we’re bringing out all the big guns for this leave in hair mask. This is a mix of organic cold pressed castor oil with a great mix of essential oils that all contribute in their own way to stopping hair loss. Argan oil is not necessarily an oil that is going to stimulate hair growth, but it does repair the cells in your hair and nourishes your scalp and hair follicles. This will thicken and give your hair a healthy glow. The sweet almond oil in addition to the castor oil will stimulate the scalp, reduce inflammation that could be responsible for your recent hair loss. Clary sage and cedarwood are both known to at a very minimum stop hair loss but may even promote hair growth. Then peppermint oil stimulates the scalp and roots of your hair follicles which should help sluggish hair to grow faster. To properly coat your hair with the oil, it should be damp. And clean, too. So, take a shower and wash it well. After the shower, towel dry but leave it damp to the touch. Then add about a quarter size portion in your palm and rub it between your hands. Spread your fingers and really get your hands down to the scalp and start rubbing it in. Move your hands out towards the end of your hair. Then kind rub it all over as if you are trying to dry your hair with your hands. This should have it evenly coated. Do this about 30 minutes before you go to bed so your hair is dried enough that it doesn’t leave your pillow too greasy. You should use a pillow case that you don’t care much about, though since it will likely get ruined eventually from the oils. In the morning, make sure to lather and rinse twice to get all of the oil out of your hair. You can also do this in the morning and leave it in all day. Same as before, you need your hair damp and then apply. After your hair dries you can style it the way you like. You may find your hair product not working quite as well as it should, however. At night make sure to wash it out before bed. How often should you use the castor oil mask? Castor oil can end up irritating your skin even though it is supposed to reduce irritation. If you have sensitive skin, I don’t recommend using a castor oil mask more than once a week. For normal skin, two to three times a week will do the trick. Once you see the results you are happy with, then continue to use the mask once a week or at least when you notice your hair starts needing a boost again. Cold pressed castor oil hair masks might not be the first thing you think about when it comes to stopping hair loss. But, the best castor oil for hair growth can really show you some good results. If you have read anything about it then it just makes sense to use it as a leave in hair conditioner to really help your hair make a comeback. I have said it countless times in this blog when it comes to any hair loss or growth products. Don’t expect this to be a magic bullet and keep your expectations reasonable. This way you are happy with whatever results come your way. You’re not going to look like Jason Momoa after you start using organic cold pressed castor oil in your hair mask, but you will see positive results if you give it enough time. Got any thoughts on using a castor oil DIY hair mask? Let us know by leaving a comment below!